PORTLAND — Gaven Jolley knows what it takes to become a high school state wrestling champion. 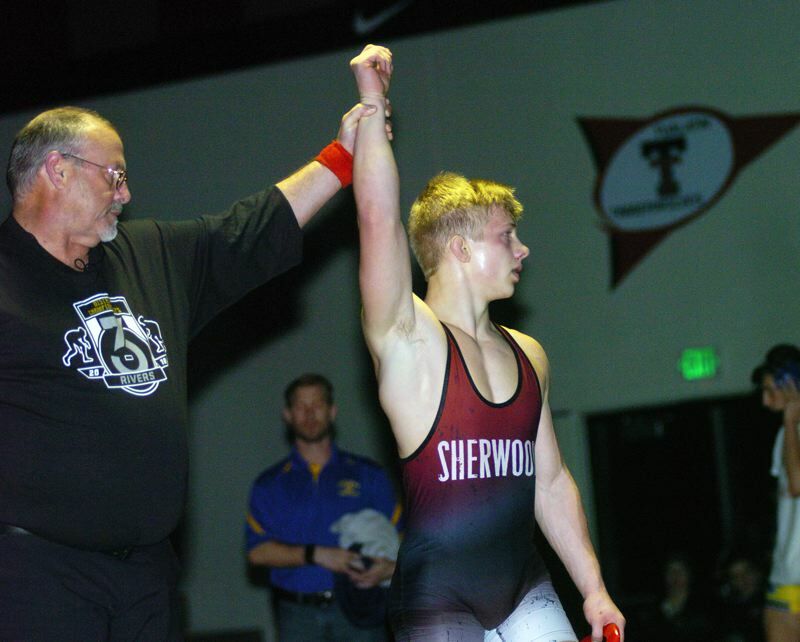 Heck, you could even call the Sherwood High School junior an expert at it — after all, he's already claimed a pair of Class 6A state wrestling titles. This week, he's going to try and make it three in a row. Jolley will get a chance to capture his third state wrestling crown when he competes at the OSAA Class 6A State Wrestling Tournament, which will be held Friday and Saturday at Veterans Memorial Coliseum. "I'm looking for another state title," Jolley said after winning his third straight Three Rivers League district championship back on Feb. 3. "I've done everything I can to do that. So, I just have to bring it mentally." Action at the state tournament is set to start at 8:30 a.m. on Friday. On Saturday, wrestling starts at 8:30 a.m. The semifinals are slated for 9:45 a.m., with the state championship finals set to start at 6:30 p.m. The top four wrestlers in each weight class at the various district tournaments advance to compete at this week's state tourney. There will be 19 area grapplers — eight from Sherwood High School, six from Tualatin and five from Tigard — participating in the Class 6A state tournament. Jolley, who won a Class 6A state championship at 113 pounds two years ago as a freshman, and then triumphed at 120 at last year's state tournament, is the No. 1 seed at 126 pounds this year. He'll open the Class 6A state tournament Friday with a first-round match against Lincoln junior Cormac Glynn. Also for the Bowmen, sophomore Logan Swanson, at 113 pounds, will open the state tournament with a first-round match against Grants Pass freshman Josef Miner. Sherwood senior Jack Murphy, at 120, drew a first-round bye. He'll open the tourney with a second-round match against either Jefferson junior Filipe Mateo or No. 5 seed Sage Brown of Oregon City. Sherwood freshman Dallen Jolley, also at 120, will open the tourney with a first-round match against No. 2 seed Nick Capetillo of Westview. Sherwood sophomore Philip Resch, at 132, will open the tourney with a first-round match against Liberty senior James Roe. Bowmen senior Rustin Williams, at 182, drew a first-round bye. He'll face either Westview junior Kianush Behbehani-Escobar or fifth-seeded William Duffy of Lincoln in a second-round match. Sherwood junior Jackson Barton, at 220, will open the tourney with a first-round match against Roosevelt junior Melipone Aisea. Bowmen senior Jayden Cuthbertson, at 285, will start the tournament with a first-round match against Roosevelt sophomore Sergio Gonzalez. Leading the way for Tualatin, senior Jarius Jackson, who is the No. 7 seed at 195, will open the tournament with a first-round match against Reynolds senior Jonas Woody. "Honestly, I'm just looking to do the best I can," Jackson said at the district tournament. "I know it sounds cheesy. We have a pretty big amount going to state, that's good, especially for the young team that we have. It's just nice to have just a sense of home." Also for the Timberwolves, junior Argenys Abarca-Lopez, at 113, will faced No. 3 seed Chase Mitchell of North Medford in the first round. Tualatin junior Sami Victoriano, at 120, drew a first-round bye. He'll face either Sprague freshman Simo Artunyan or No. 7 seed Richard Vasquez of Century in a second-round bout. Tualatin junior Jake Reser, at 145, also drew a first-round bye. He'll meet either Centennial's Riley Salazar or No. 3 seed Colin Rietmann of Roseburg in the second round. Tualatin junior Gavin Moore, at 220, will face third-seeded Julian Stone of North Medford in a first-round match. Timberwolf senior Anakin Rivera, also at 220, will meet No. 7 seed Michael Cormier of South Medford in a first-round match. Tigard's wrestlers are taking some high hopes to the state tournament. "I'm hoping to get first, of course," said Tigard senior 152-pounder Cole McCallister, who will face either Beaverton's Evan Kepner or top-seeded Ein Carlos of North Salem in the second round. "I want the title. It will take a lot of hard work. I've really got to focus." Tigard senior Jacob Beck, who placed third at 182 last year, is the No. 7 seed in the same weight class this year. Following a first-round bye, he'll meet either Harun Catic of Wilson or Gustavo Silva of Forest Grove in the second round. Also for the Tigers, freshman Cameron O'Connor, at 106, drew a first-round bye. He'll meet either North Medford's Jacob Watson or No. 8 seed Aidan Lybarger of Mountainside in the second round. Tigard junior Emilio Jimenez, at 132, will face Oregon City's Zachary Colipano in a first-round match. Tiger junior Javier Velasquez, at 285, will battle Sprague's Isaac Garcia in a first-round bout.